Though peaches were originally planted in St. Augustine, Fla., Franciscan monks introduced them to St. Simons and Cumberland islands along Georgia's coast in 1571. By the mid-1700s peaches and plums were cultivated by the Cherokee Indians. Samuel Rumph, a middle Georgia peach grower during the early 1900’s, revolutionized the peach industry with a new variety which he named after his wife Elberta. This yellow-fleshed peach was of superior quality and shipped better than previous varieties. Elberta remained the leading peach in Georgia until 1960’s but newer varieties have since replaced the Elberta in commercial use. Although the Elberta remains the most famous peach name, Georgia now produces more than 40 commercial varieties, and the Elberta is not one of them. 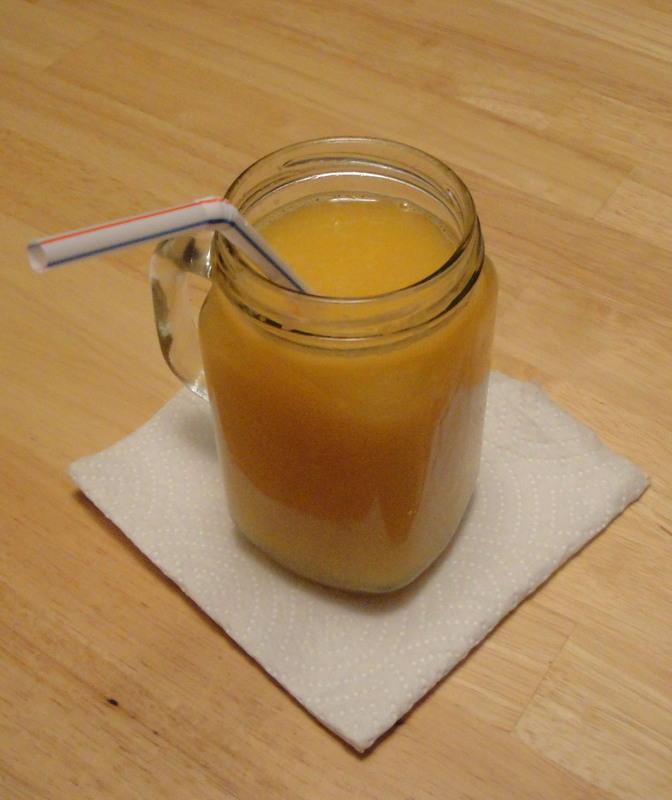 Try this healthy refreshing smoothie. Great for breakfast or pick me upper. Add all ingredients to a blender and blend until smooth, about 1 minute. Add a little water if you need to loosen it up. Enjoy! I love peaches. Your smoothie sounds real refreshing with the ginger. I've needed a pick me upper all week. Perfect timing with this one. Peaches are one of the best treats of summer. The healthy-sugar energy boost from this smoothie must be quite exhilarating! Great presentation in that little jar! I love peaches, and I'll make this yummy smoothy from ripe Southern Illinois peaches, the best! I love peaches, and this smoothie looks amazing! I have yet to make any smoothies with all the fresh summer fruit, I need to soon! Looks delicious! I need something like this for a pick-me-up instead of coffee! This sounds delicious Christine and I like the added ginger flavor. Hope you have a lovely weekend. Mmm...peaches just smell like summer! What a perfect way to start the day!! Now I need to get some peaches!! I'm amazed to discover that the Cherokee Indians had access to frozen peach slices! Astonishing! Please read the post. Nothing mention about the Indians having access to frozen peaches. I love peaches and smoothies. Brilliant!! While I don't know what type of peach it is, my dad has a tree that every year brings bags and bags of peaches to our tables. We are always on the lookout for new recipes, and this one is sure to be a hit. I can see my kids making it and freezing any leftovers into popsicles! Love peaches. Looks like a very yummy drink!